Special note on the origins of this project. 01.03 List of drawings and graphs. 01.04 Typical list of maps. 01.06 List of key words. 01.08 Information on the local NGO. 01.11 Declaration of participation of the local population. 01.12 Declarations of support from national civil society. 01.13 Declarations of political support. 01.14 Press articles on the project. 01.21 Extra help in navigation amongst the project files. 02.01 General information on Kenya. 02.04 List of villages in the Kiogoro project area. 03.00 PRESENT SITUATION IN THE PROJECT AREA. 03.02 State of drinking water supply in the project area. 03.03 Agricultural production and its storage in the project area. 03.04 Domestic life : cooking facilities. 03.11 Habitat and the home. 04. 00 PROJECT GOALS AND EXPECTED RESULTS. 04.04 Activities related to specific goals. 04.06 The economic bases of the project. 04.07 Some basic project concepts. 04.09 The development structures to be created. 04.11 Parties participating in project execution. 04.13 Certainty as to project execution. 04.14 Taxation of transactions within the local money LETS systems set up. 04.15 How a local money (LETS) transaction works. 04.16 The effects of inflation on the Cooperative Local Development Fund and gift content. 04.17 Project insurance and forfeit in the form of gift in case of loss of capital structures. 04.18 The circulation of information. 04.19 Recycling of funds and importation of items needed for productivity increase. 04.21 The chain of responsibilities. 05. 00 THE ORDER OF SEQUENCE FOR PROJECT ACTIVITIES. 05.04 Four-page summary for funding purposes. 05.05 Description of the action for funding purposes. 05.07 Statutes for the Cooperative for Kiogoro for the on-going management of the project structures created. 05.08 Statutes for the NGO Kiogoro Integrated Development Project responsible for execution of the project structures. 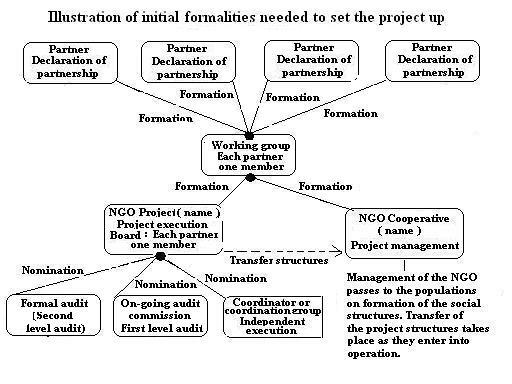 05.09 Illustration of the formal steps necessary to get project execution started. 05.10 DESCRIPTION OF THE PLANNED SOCIAL STRUCTURES. 05.12 Creation of the hygiene education structures. 05.13 Creation of the tank commissions. 05.14 Creation of the well commissions. 05.15 Creation of the project management structure. 05.16 Creation of the social security structure. 05.20 DESCRIPTION OF THE PLANNED FINANCIAL STRUCTURES. 05.21 Interest-free cooperative local money structures. 05.22 Interest-free cooperative micro-credit structures. 05.30 DESCRIPTION OF THE PLANNED PRODUCTIVE STRUCTURES. 05.31 Units for the production of items made from gypsum composites. 05.32 Units for the production of mini-briquettes for high efficiency stoves. 05.33 Production of bio-mass for mini-briquettes. 05.34 Installation and on-going maintenance structures. 05.35 Structure for local radio station. 05.36 Some other typical productive structures. 05.40 DESCRIPTION OF THE PLANNED SERVICE STRUCTURES. 05.41 Drinking water supply structures. 05.44 Lighting for study purposes; lighting and photovoltaic refrigeration in clinics. 05.45 Smoke hazard elimination structures. 05.50 SOME COMMONLY PREFERRED NON-PRODUCTIVE STRUCTURES. 05.60 SUMMARY OF IMPROVEMENTS TO THE QUALITY OF LIFE OF THE INHABITANTS. 05.69 Contributions of users and on-going maintenance and administration costs. 06. 00 THE PHASES OF PROJECT EXECUTION. 06.01 Activities schedules per year. 06.02 Activities schedules per quarter. 06.20 Second, workshop execution phase : about 9 months. 06.21 Circulation of funds : see bank circuit chart. 06.22 Creation of health clubs and hygiene education. 06.23 Creation of local social structures. 06.24 Creation of local money LETS structures. 06.25 Creation of micro-credit system structures. 06.26 Creation of gypsum composite production units. 06.27 Creation of recycling structures. 06.28 Creation of structures for bio-mass production. 06.29 Creation of the structure for local radio station. 06.30 Creation of drinking water structures. 06.40 Third, project execution phase..
06.50 Fourth : monitoring and evaluation phase. 07.00 Balance sheet and cost and expenses analysis. 07.01 Documents for funding applications. 07.02 Auditing structures (ex section 04.20). 07.04 Budget in form for funding applications. 07.05 Economic and financial analysis for funding applications. 07.12 Annual balance sheets and schedules. 07.13 Excel spreadsheets for budget preparation (for technical use). 07.14 Built-in protection covering the interests of funding parties. 07.60 Funds available for micro-credits. 07.70 Financial Sources sheet for funding applications. 08. 00 FILES ON SOME SPECIFIC ASPECTS. 08.10 List of files specific to hygiene education, drinking water supply and sanitation. 08.30 The ecological aspects of the project. 08.40 Aspects relating to agriculture and food security. 08.50 How the project helps achieving most of the Millennium dvelopment goals, targets, and sub-targets. 09. 00 ATTACHMENTS FOR EXTRA INFORMATION AND READING. 09.11 Bibliography on the work of Clodomir Santos de Morais. 09.12 Information on capacitation workshops..
09.13 Gypsum composites : Technology..
09.14 Gypsum composites : Applications..
09.15 An indicative programme for hygiene education. 09.16 A simple introduction to local money systems. 09.17 Information package LETS LINK UK..
09.18 Transparents for the presentation of the Model. 09.19 Power point presentation of the Model. 09.20 25 Steps towards local development (industrialised countries)..
09.21 Some information on the solar submersible horizontal axis pumps..
09.22 Village Life inertia hand pumps..
09.23 Paper on the role of micro-credit in development. 09.24 Paper on drinking water supply and development..
09.25 Paper on photovoltaic power and bio-mass and development. 09.26 Paper on Photovoltaic power: one of the bases of development..
09.27 Paper : New horizons for renewable energy..
09.28 Environmental laws applicable to this project..
09.31 Computerised administration of local money systems. 09.32 Articles 119-126 of the Constitution of Venezuela, 1999, on the rights of indigenous peoples. 09.33 CER certificates Kyoto Treaty : programme of activities as a single CDM project activity. 09.34 Grey water management in low- and middle-income countries. 09.35 In search of drivers for dry sanitation . 09.36 The use of urine and faeces as fertilisers. 09.37 The Primary Health Care Package for South Africa : a set of norms and standards. 09.38 World Health Organisation list of essential medicines. 09.39 Fundraising Tips for Community-Based NGOs in Developing Countries. 09.41 Winblad Uno et al, Ecological Sanitation..
09.42 New Economics Foundation, Powerpoint presentation on local economies "Plugging the leaks"..
09.43 New Economics Foundation, Handbook on "Plugging the leaks" in local economies..
09.44 Light Up the World Foundation : Information on LED lights for use in developing countries..
09.45 A green oil for the world. By courtesy of periodical Sun & Wind Energy..
09.47: Water filtration using Moringa paste with Biosand filters. 09.48: How to collect and conserve seeds. 09.49: Roofwater Harvesting :a handbook for practioners by T.H.Thomas and D.B.Martinson,2007. By courtesy of http://www.irc.nl/page/37471 the IRC International Water and Sanitation Centre, Delft, Netherlands. 09.50: Draft charter for the rights of african women, Addis Abeba 28th March 2003. 09.51: African Charter on the Rights and Welfare of the Child, 1990. Main menu of the Model.